Companies around the nation are adopting fleet changes that improve their environmental footprints, many of them using Earth Day as a time to tout their own green cred. The fleet managers who operate the cars, trucks, and other vehicles of corporations are becoming more and more involved in "greening" their fleets in order to improve the environmental impact of their companies. While some of these changes are for reasons of legal compliance, most of them are in order to improve the overall "green credibility" of the companies involved for marketing purposes. This is especially true of multinational companies that are required to report greenhouse gas emissions to various governments in whose countries they operate in. A typical corporate fleet sees replacement every three years, with about a third of the company's fleet assets being replaced annually. This time frame allows for optimum trade-in value versus return on investment for the vehicle's purchase. Newer vehicles generally have higher efficiency standards than their predecessors, which improves fleet mileage overall. While higher cost and lack of appropriate model types are obstacles that often mean that greener vehicles do not enter every corporate fleet. Many fleets, however, add a few token "green vehicles" to their lineups in order to use them as marketing opportunities to show the company's Earth Day credibility. Most corporate fleet greening, however, is happening in a less flashy, more subtle way. Nearly all businesses with large fleets are adopting driver training programs to teach better, greener driver behavior. This is especially true in the trucking and package delivery sectors, where even small changes in the way a vehicle is driven can give large improvements in fuel economy. Large companies like AT&T, Coca-Cola, FedEx, Frito-Lay, PepsiCo, Ryder, Schwan's, Staples, UPS, and Verizon have committed to greening their fleets in big ways. These companies are adopting alternative fuel vehicles in test programs or fleet deployment, adding employee incentives to improve economy, and buying more efficient, job-specific vehicles to improve overall performance. AT&T, for instance, just deployed its 5,000th alt-fuel vehicle, getting 1/3 of the way towards its 2018 goal of 15,000 alt-fueled vehicles. Coca-Cola, PepsiCo, Ryder, Schwan's and UPS are all adding hybrid and natural gas vehicles to their fleets while FedEx, Frito-Lay and Staples have added electric trucks to their operations. 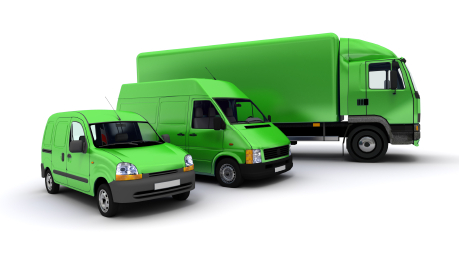 Within the industry of fleet management, there are definite trends towards more sustainable management. Despite being held back by fiscal austerity requirements, many fleets are still showing great improvement in their overall efficiency. The idea has caught on so well that an annual Green Fleet Conference is held to specifically address corporate fleet sustainability and the technologies and options available for that goal. This year's will be held in October in Schaumburg, Illinois. Most Electric Vehicles Sold Are For Commercial & Industrial Applications In an October 24, 2011 article, Electric Vehicles Research indicated that currently 60% of the value of the electric vehicle market is being spent on commercial and industrial vehicles – and this trend is expected to continue and grow into the next decade. Heavy industrial vehicles (those used do heavy lifting, such as forklifts) make up the largest segment of the market. This is understandable, since by law, forklifts must be electric to be used indoors. While little opportunity may remain in this market, there are plenty of other uses for electric vehicles in the commercial and industrial sector. Airports are under increasing pressure to switch their Ground Support Equipment (GSE) to pure electric versions, both on and off the tarmac. Besides lowering their carbon footprint, this would lower their cost of ownership, cost of maintenance and their exposure to price increases in fossil fuel supplies. Governments, wanting to be perceived as environmentally conscientious, will help to drive the continuing growth of the commercial and industrial EV market. This market is seen as being less dependent on government incentives and funding than the more fragile personal EV market, and innovations seem to appear in the industrial and commercial market sooner. Electric vehicles offer so many advantages over traditional vehicles in the industrial/commercial environment. Electric delivery vehicles cope better with frequent stopping and starting. Electric shuttles can be used to transport visitors through industrial plants, airports, and other venues with no concern about noxious emissions. Rangers can use electric vehicles to access areas of parks and natural areas where it is important that environmental impact be limited. The applications are only limited by the imagination!